The main vehicle for private foreign investors to conduct large-scale business in North Korea is a joint venture with a local partner, judging from available open sources. 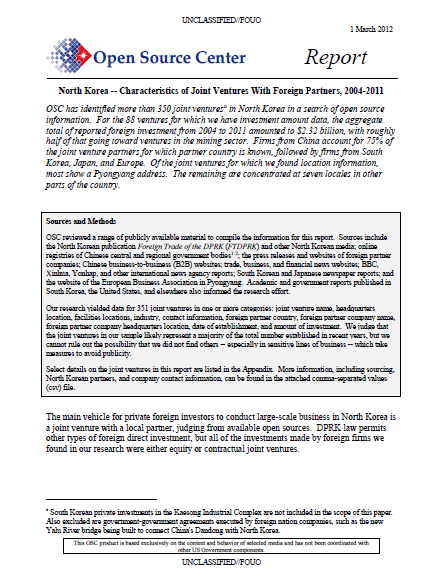 DPRK law permits other types of foreign direct investment, but all of the investments made by foreign firms we found in our research were either equity or contractual joint ventures. North Korean joint ventures, like other companies in North Korea, appear to be largely staffed by Koreans and operate under the constraints of the North Korean system. Majority ownership of joint ventures, however, appears to be primarily in the hands of the foreign partners: eight of the 12 joint ventures for which we have ownership share information are controlled by overseas firms, and the remaining four are split 50-50 (Table 1). Directorships and presidencies of North Korean joint ventures are often held by an officer of the foreign company. OSC has identified 351 North Korean joint ventures with partner companies from around the world and in a range of industries (Table 2). More than 260 of these joint ventures have been active as recently as 2004. Partner firms in North Korean joint ventures have come from Asia, Europe, Oceania, and North America (Table 2), but Chinese firms are the dominant investors. China accounts for 205 of the joint ventures we found. Japan with 15 and South Korea with 10 are a distant second and third. European companies from Italy, the United Kingdom, Netherlands, and Germany are engaged in joint ventures in North Korea, focusing on finance and technology. Egyptian and Thai firms do not sponsor many JVs, but their partnerships are crucial to North Korea’s domestic communications network — managing the country’s mobile telephone network and Internet services, respectively. The share of Chinese firms as a total of new North Korean joint venture starts appears to be sharply increasing. Out of the JVs for which we know country of investor and start date, only four in ten had Chinese investors before 2004. From then until the end of 2011, however, Chinese firms represent about 87 percent of JVs started, 148 of the 167 in this set. 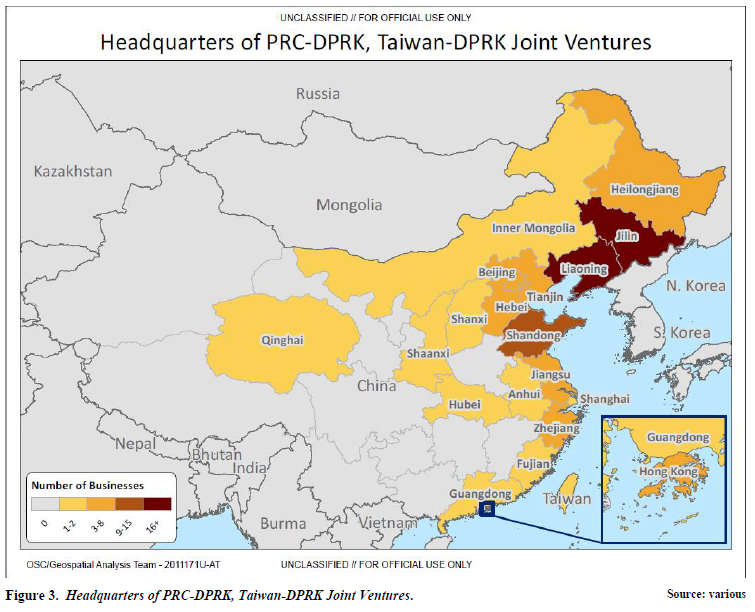 Most of the Chinese firms that we found with specific location data were from the northeast provinces of Liaoning and Jilin, both of which share long borders with North Korea (Figure 3). Companies based in Shandong, Beijing, and Tianjin are also major players in joint ventures. When compared with their investment in other destinations, though, Chinese firms’ investment in North Korea is small. Even firms from Liaoning Province — despite their proximity to the DPRK — sent almost 99% of their outbound investment from 2006-2011 to destinations other than North Korea, according to a provincial government record of private outlays (Table 4).